SUBHEAD: Growth has been the solution to America's problems at a cost to nature and its inhabitants. 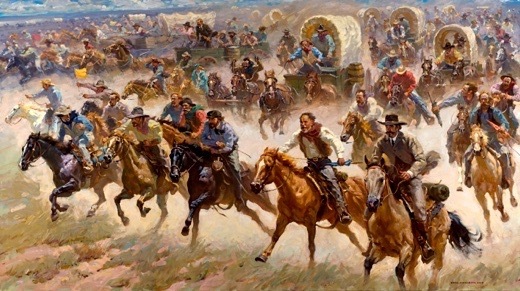 Image above: Painting of Oklahoma Landrush in 1889 when settlers furiously dashed across the Oklahoma plains to stake their claims to nearly two million acres put up for grabs by the U.S. government. From (http://www.history.com/news/the-oklahoma-land-rush-125-years-ago). Note: You can read Parts 1, 2, and 3 of this series on Resilience.org at their respective links. In April 1889, fifty-thousand people stood shoulder to shoulder, impatiently shuffling, waiting on the border of Oklahoma territory. Many were on horseback; others were poised to charge on foot, laden with tents, pans, and tools. Wagons too stood at the ready, while trains full of passengers let off steam, waiting to start the journey to the sites that would, within hours, be the brand new towns of Guthrie and Oklahoma City. As the expectant home-seekers waited with restless patience, the clear, sweet notes of a cavalry bugle rose and hung a moment upon the startled air. It was noon. The last barrier of savagery in the United States was broken down. Moved by the same impulse, each driver lashed his horses furiously; each rider dug his spurs into his willing steed, and each man on foot caught his breath hard and darted forward. A cloud of dust rose where the home-seekers had stood in line, and when it had drifted away before the gentle breeze, the horses and wagons and men were tearing across the open country like fiends. By the end of the day Oklahoma lay staked and claimed. The new city of Guthrie had been laid out and was by sundown the home to an estimated seven or eight thousand prospectors and speculators. By week’s end, crude restaurants, shops, and homes had been thrown together, and furious digging had produced the wells necessary to quench the thirst of the new inhabitants. While the Oklahoma land rush is certainly among our most dramatic, rushes have been an vital part of America’s history, whether the pursuit of happiness fixed its sights on land, gold, or oil; such exuberance, hope, and instant triumph, and with it the dashed dreams, have shaped our landscapes, both inner and outer, leaving in their wake ribbons of highway crisscrossing the land and the scars of an unsettled life lived always on the move. The Homestead Act of 1862 was fundamental to the development of these American landscapes. Between 1862 and 1976, when it was finally repealed, 1.6 million homesteaders lay claim to 270 million acres of land. For its part, the California Gold Rush brought around 300,000 seekers from around the globe to California. Between 1848 and 1850 San Francisco grew from a settlement of 1000 to a city of 25,000. But it all began earlier than that. Between 1607 and 1623, Charles Mann reports, seven thousand settlers landed in Jamestown Virginia. Even though four out of five died, they kept coming, wave after wave, and not just there, but throughout the Americas, lured by gold, silver, sugar, and tobacco, then guano, cotton, and rubber, each in its own glimmering way a medallion of unsustainability. These rushes are most often presented as episodes in our national myths of free people seeking a better life, packing their whole life, and their future, on their backs and heading towards a beckoning frontier. That’s the story we tell ourselves. And even critical intellectuals, soberly aware of our nation’s many originary sins, can’t resist the draw of the limitless when it emerges once again, as in the Silicon Valley rush of recent decades. We might consider these national stories footnotes to one of our great documents of Growthism, The Frontier Thesis of American History, announced by Frederick Jackson Turner in 1893. Turner’s project is to explain “the peculiarity of American institutions,” or to be more direct about his motives, our particular national excellence. This ideal is still with us. It has turned to new frontiers like space or the inner self. Now, ours are the frontiers of technology and data, and today’s conquistadors the “innovator” or “entrepreneur” battling against the ageless forces of marginal inconvenience. By today’s standards, nevertheless, Jackson was not doing serious history, but was engaged in national myth-making, though many of today’s historians may one day be similarly judged. He directly downplays the role of slavery in America and the land is only “free” by ignoring its native inhabitants, who were characteristically ushered onto reservations to make way for the white settlers who would, in matter of decades, turn Oklahoma (for its part) into a dusty desert. Is the American character, should one actually exist, fluid, or perhaps just soluble; simple, or base; reborn, or perennially distracted and always on to something new and bigger? Does it reach for a sublime and Earthly infinite, or does it have as its highest point of navigation a point lying half way between East and West Egg? However we answer these questions, it is difficult to maintain that these rushes and this constant westward expansion were simply the proving ground for a stalwart American character, a place where hero would become victor. An examination of the political record and the way the Federal government strategically engaged in expansion as a response to political pressures should dispel any idealism. America, like Australia, was initially prized as a place not only from which riches might be drawn, but somewhere upon which Europe’s excess population and unwanteds might be released. This same pattern was soon adopted by the sovereign American states. The mere existence of a space to the West, as I have argued in the past, enlivened Jefferson’s imagination which was, in the face of its vastness, given to repeated and habitual references to infinite and limitless possibility. But in a far more pragmatic way, Jefferson’s Empire of Liberty was to spring forth from the “nest” of the “new confederacy,” as Americans would, according to his plan laid out in a 1786 letter, simply outbreed European rivals and expand across the continent. After the Civil War, the transcontinental railroad knitted the north and south back together. And when the West had been fully seized as prophesized by Fredrick Jackson Turner, it is no coincidence, the United States soon surpassed its territorial boundaries with the great expansions of the late 1890s and the taking of Cuba and the Philippines from Spain. Land was used to compensate unpaid soldiers from the Revolutionary war, was offered to civil war veterans, and eventually affordable homesteads in America’s suddenly expanding suburbs were made available to soldiers returning home from WWII. With room to roam, countless political challenges disappear. Our politics talk of little else than the promise of space, opportunity, and a distant goal to keep us moving forward. A return to Growth, in other words, ended the Depression, and the Democratic party has never looked back in its attempt to maintain Rooseveltian social progress and egalitarian economic values by way of a constantly expanding economic pie. This is all to say that growth is a solution. But a solution to what? The normal view is that growth is the solution to stagnation, but this begs all useful and interesting questions—and especially the ones pressing for answers as we confront the limits to growth. For much of human history, and in societies that were able to sustain themselves over the long run, what we mistakenly call “stagnation” is better described as the cycle of life, with a steady and repeating exchange of inputs and outputs operating within a stable local ecology. Stagnation, understood ecologically, is a problem only when the wheel of life has stopped turning, when staying put amounts to wallowing in your own waste, when movement and expansion is required in order to find undenuded and unsullied place. The idea of the pursuit of happiness has been literalized across the landscape of the Americas and has been implanted in our hearts. It is no wonder that we dream of a supply of infinite energy and view the economy as perpetual motion machine. Growth, we might then conclude, is a solution to growth, or at least to the conditions that growth creates. Growth becomes necessary when, in Wendell Berry’s words, we depend on energy economies of mere production and consumption, rather than ones appropriate to our biological nature. An economy of production and consumption alone is extractive and always on the move, looking for new and growing throughputs, inured to the care of stocks. Care is not fostered by a nation built upon land-rushes, nor upon a plantation system and slave labor; and return has connotations of the closed and binding moral and psychological orders that make the carefree, utility-maximizing, profit-seeking Individual shudder. At this point it may be helpful to refer back to my previous installment about the Growthist Self, and drill a little deeper into the devil’s bargain that the Growthist Self is forced to make. Contrary to the modern image of the past as merely a dark age of misery and drudgery, to which a modern one of unburdened possibility is contrasted and from which we lucky moderns bravely escaped, premodern societies offered people an order of goods that have disappeared from modern society. These premodern social orders, when operating properly, included principles of responsibility and care absent from a competitive society, the job of which is to provide only an open backdrop for individual achievement. While we celebrate the belief that “there are no limits,” limits, as any parent knows, help provide stability and order, and also a sense of security. While we rejoice in our mobility, it comes with costs which our ledger books may not record. Traditional social roles are often despised in modern society because of the limits they impose; but we forget that the difficult passage from adolescence into adulthood was once far less perilous than it is today. We eschew inherited community—it is not freely chosen and has ties that painfully bind–but wonder at our loneliness and alienation. We often treat choice as a synonym for good, but then must ignore the resulting anxiety and regret as the inevitable price of progress. What we like to think of as advanced industrial nations do, of course, offer freedoms and opportunities previously undreamt of–and if I am taken to be suggesting that this gift should be thoughtlessly abandoned, then my ambivalence has been buried too deeply amidst my consideration of the generally unthinkable. I would not be writing this were I not myself desiring the exhilaration of change. But advanced societies suffer from a kind of sickness of the self not seen in traditional societies. America exhibits this sickness more than any other—the mass incarceration and destitution amidst plenty; the gutted working class trudging the aisles of Walmart looking for glimmering cellophane hope; the throngs of uneducated, the American idle filling purposeless days with unhealthy food and cheap distractions; the rage, frustration and violence among neighbors, here, the multi-billion dollar defense and marketing budgets, there; the addiction and lost children in a nation that not only consumes a quarter of the world’s natural resources, but a quarter of its recreational drugs, as well. We, more than any others, know not how to sit quietly in our rooms. Are the pay-offs worth it? Or is life lived in denial of limits a failed experiment, its victims piling up like careening cars on a foggy highway? For amidst the excited impatience and exuberance of our Oklahoma land seekers, and the myths of American rejuvenation and exceptionalism, we miss something equally basic and profound: that these land seekers must race just to find a home. The thrill of contest hides the indignity of it, not to mention the terrible possibility of homelessness. If the pursuit of happiness is a race, losers there must be—and are. There is a standard Liberal, and at least tacitly Growthist, response to my suggestion that life without limits is not a good unto itself. If cars are piling up in the fog, “lift the fog,” they will say. There is nothing wrong with the absolute freedom of self-creation and the elimination of limits, both inner and outer, nothing wrong with structuring life like a race. Rather, the only problem is that there are hidden obstacles, half of which social progress has already removed, the other half of which the so-called arc of history has in its sights. With the correct (liberal/progressive) politics, the argument continues, we can finally eliminate all such barriers and usher in an age of purposeful equality, fraternity, and healthy contentment, all equals in the pursuit of happiness. We can lift the fog—and then race on, never having to return. But what if we can’t lift the fog? What if we lift it only to reveal ecological limits bearing down on us? I’m tempted, here, to play out this metaphor of the fog, but on consideration realize it would lead us down a byway where we will only find another inconclusive dialectic of the Enlightenment. Suffice it to say, then, at least for people (like me) who cut their teeth as liberals it is indeed difficult to access a perspective which looks positively on limits and boundaries or traditions and roles. Resurrected limits usually march under the banner of last year’s hierarchies (under the banner also known of as “conservative politics”), and as such limits are employed in the pursuit of power rather than as an alternative form of the good life. But in failing to appreciate a deeper, I don’t know the right word—perhaps conservativism, perhaps something else—we fail to see the way the conditions of Growthism are deeply unsettling, and that the boundless and unguided opportunity that sits at the heart of Liberalism and America and its culture of eternal change forms not a kind of sociality, but an anti-sociality. For a society such as ours, then, an entirely new sort of social glue had to materialize so that we might coexist and interact–though glue is the wrong sort of metaphor to describe the primary means of political coexistence in Liberal democracies. Lack of growth, in contrast, holds people together in ways we do not know how to manage. Politicians and economists are not mistaken about the perils of a no-Growth society, for without growth we become angry and resentful, turn on each other in bitter, tribal rivalries. Where they are mistaken, however, is their misapprehension of Growth as normal, not to mention sustainable. Lack of Growth is not the crime against humanity, per se, as today’s Growthists imagine. Rather, there is at present a historical mismatch between the Individual and the sort of static and steady state that sustainability requires. The Individual is at home only on the range. As I have been arguing here and in my previous installment, then, the shipwrecked modern Individual has ceded a number of comforts and safeties of community and place, and must be given something else in return, something to lure them into a perilous beyond. Early liberals, the framers of our constitution, for instance, were not fully aware of the Growthist nature of the systems they were constructing and hoped that the promise of freedom and a degree of possibility and opportunity might be all that was required (they also depended on considerable hold-over conventions and traditions that have subsequently melted into air). But it turned out that the Individual always needed more, a principle now enshrined in the American Dream with little question—that each generation should be “better off” than previous ones. There is no set amount that constitutes enough or ever could. Rather and in a purely relational sense, there must be the promise of continued and permanent expansion. This is the devil’s bargain that the Individual makes, though to call it a bargain is misleading: the uprooted Individual never had a choice but to be thrust into a world of choice. But the trade-off, if we are to conduct a trans-cultural comparison, is this: for relinquishing a certain kind of order, stability, and sense of place we are in turn given the promise not just of “a lot,” but the promise of more. And it is the promise of more, and enough delivery of it, that has held Liberal society together. I, for one, have no faith that it can survive any degree of contraction. Those few among us who actually understand how our monetary system works may at this point suggest that the Individual’s requirement for Growth has mainly to do with a financial system which must grow simply to stand still and maintain itself. I will turn to these issues in my next installment, but for now let me suggest that the historically determined present need to Grow exists more broadly than is explained by the way our money is loaned into existence, as important as that is to our current reality. There is a structural element that cuts deeper, one that is remarkably simple. Since the Individual is responsible for plotting his own course and attaining her own fortune by way of competition, the more chances of winning there are, the more orderly and cooperative a society will be. If a static or shrinking economy is a zero-sum (or negative-sum) game, the system will be swamped with losers. That is why our society is enamored with the notion of the win-win situation, and with metaphors like the rising tide that lifts all boats or the economy that trickles down. It explains why Americans were quick to grasp and embrace Reagan’s rather complex and counterintuitive supply-side economics. Growthism stretched or incredulity to the point where we can accept nearly any sort of win-win scenario, no matter how magical the thinking behind it. We might similarly note that the outlook for the competitive individual has as much to do with the consequences of losing as its relative chance. If “losing” merely means not gaining as much, as opposed to relinquishing current possessions and identities, it is easier to honorably stomach defeat. This, and not our alleged adherence to gleaming democratic principles, explains the peaceful transfer of power in the United States and other stable democracies: when the Republicans have won, or vice versa, the day-to-day lives of Democrats undergo very little change. There is no transition of property or social hierarchy, here, thus making defeat acceptable enough. Put the same people with the same beliefs and expectations into a zero-sum situation, and the results will be entirely different, as they perhaps are slowly becoming today. The moment an electoral defeat, like an economic one, has substantial impact on enough people–the moment it takes from them what they already have–the result will be revolts and the breakdown of democratic institutions. Even the vague and unconscious threat of the end of growth brings the masses into the streets. This explains why civil rights flourish in times of economic expansion, while fault lines reemerge in times of retrenchment. Under conditions of Growth, winners abound and generosity flows like wine. These dynamics also explain why a severe economic recession is rightly, in our present context, called a depression. For against the backdrop expectations of an expansive hope, economic depressions act on the body politic not unlike depression on the individual. For a depression involves the piling up of losses that begin to appear more than episodic, but part of self-reinforcing descent whose bottom is hidden from view. Hope is overshadowed by doubt and despair crushes faith. There appears to be no escape, only walls closing in and doors slamming shut, leaving the Individual alone, full of shame and defeat. Communities, in contrast to individuals, are far better adapted to contraction and might manage it without depression, though any simple suggestion that we replace the Individual with Community does no justice to the high stakes and difficult fences of such as transition. Finally, this explains my own preoccupation with the rise of the Individual, the geography of freedom, and our table of beliefs and expectations. Over the past several centuries, all matters of relieving social disorder, of increasing freedom, and curing depression other than Growth and expansion have lost their legitimacy. Now, regardless of how well they worked in the past and no matter how central they are to everything we hold dear, they are no longer viable options. Growth, now, is not a solution to our problems; Growth is our problem. [iii] McElvaine, Robert. The Great Depression (New York: Three Rivers Press, 2009), pp xlii, 348. [vii] Berry, Wendell. The Unsettling of America (San Francisco: Sierra Club Books, 1977), p. 85.